A portion of the proceeds for this event will to Tampa Police Explorers, Post 275. This event is Open to the Public!!! The 5k Runners will receive a shirt, finisher medal, bib, swag bag, and entrance to festivities after the race. 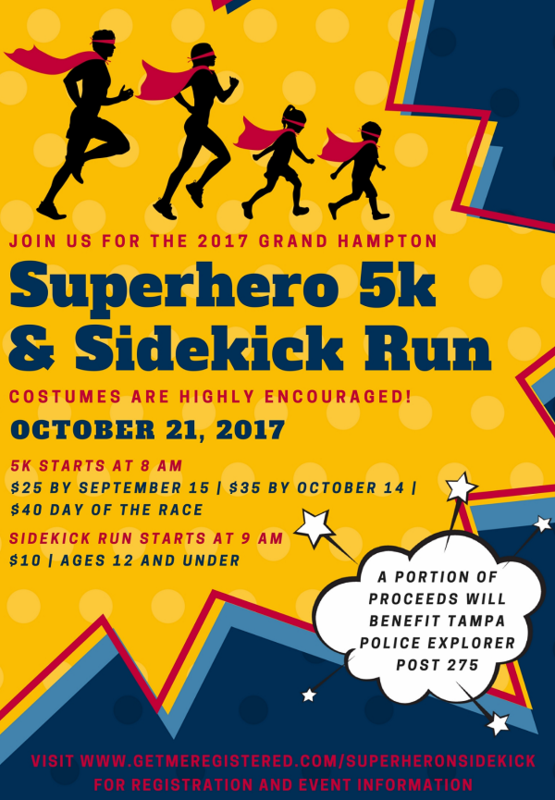 The Sidekick Runners will receive a shirt, finisher medal, and entrance to festivities after the race. Each participant receives a t-shirt, swag bag and finisher's medal. All runners are timed with a chipped bib. Results will be supplied by Florida Road Race Mgmt. Check out our course. Please click the link below to see the route in action. Results will be posted on www.floridaroadrace.com following the event. Follow the Event Results tab. When this page loaded, the official time was 3:24:19 AM EDT.